Lock in a great price for Riu Palace Bonanza Playa – rated 9.2 by recent guests! This hotel is a gem. Everything was perfect, the room, the breakfast and the staff. Highly recommend! The location is wonderful. The indoor pool and spa were lovely. The food (dinner and breakfast buffets) were absolutely incredible! For the price we paid, I wish I could give them more than 5 stars. I can’t imagine being any happier with the accommodations. Beautiful location and water views. Take your pick if swimming in the pool or jump off the dock into the Mediterranean. It’s easy to go into town on buses. Very much emphasis on services and listening to guests. Fantastic food at the restaurant. 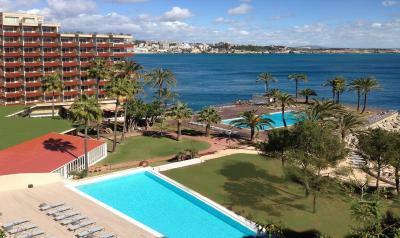 Nice to have access to the sea from the hotel, and good sea views from rooms and restaurants. Relatively quiet and clean area of Mallorca. Good taste in decoration. Very friendly and professional staff. Great location. 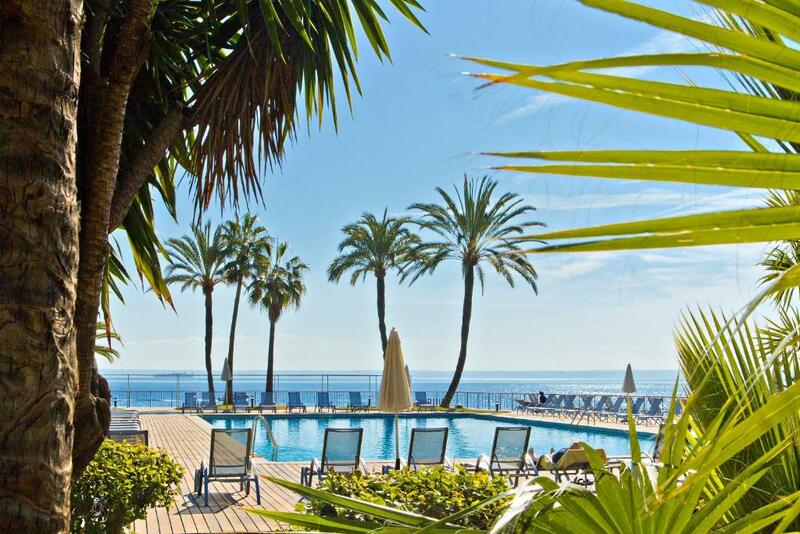 We stayed four nights/five days at the Rui Palace Bonanza Playa. It was a trip with my husband and our toddler, to celebrate our wedding anniversary and my birthday. The staff went above and beyond to make us feel welcome and the servers in the restaurant were amazing!! They took such great care of us and even made a special table setting with flowers, champagne and cake on the morning of my birthday. They were all so sweet with our daughter too! Beautiful property, beautiful views, comfortable and clean rooms. We spent most of our time in the pool - it was perfect! I'm not a beach/pool type of traveller but on this occasion I was trying to please my teenage daughter, she loved it. The staff is very professional and pamper the customers. The area is calm and there are small shops around the hotel. 3 différent swimming pools on the property and an access to the sea provides choice and avoids being packed in one side of the property. The buffet is varied and very good. 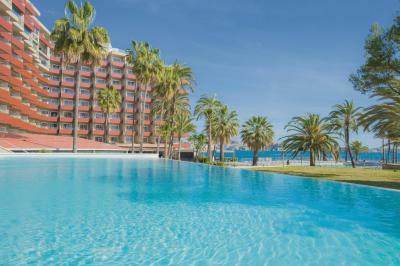 Riu Palace Bonanza Playa This rating is a reflection of how the property compares to the industry standard when it comes to price, facilities and services available. It's based on a self-evaluation by the property. Use this rating to help choose your stay! 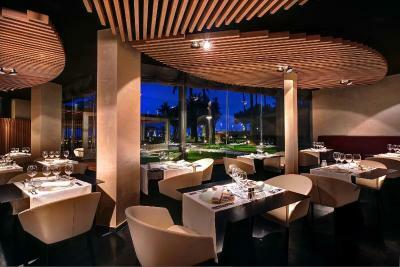 One of our top picks in Illetas – and a guest favorite. 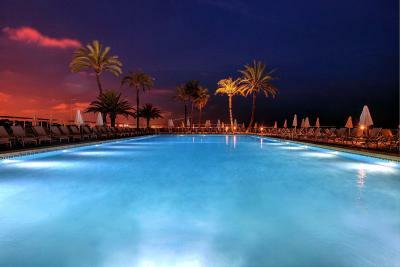 Riu Palace Bonanza Playa is located on the seafront in Illetas, just 4.3 mi from Palma. 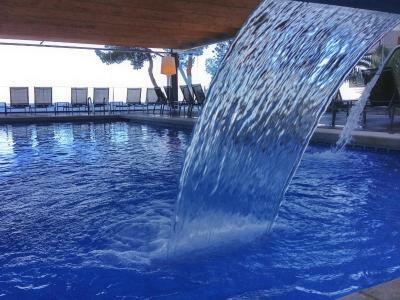 It offers direct access to the sea, an outdoor swimming pool and free access to its spa. 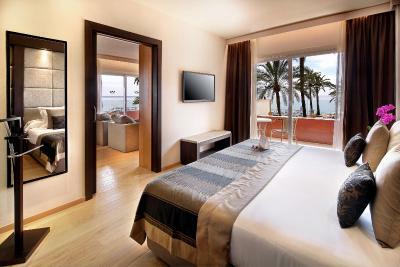 Elegantly furnished, the modern air-conditioned rooms feature a balcony with sea views and satellite TV. 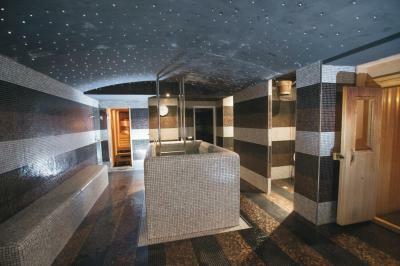 They also include a private bathroom complete with amenities. Free WiFi is available. 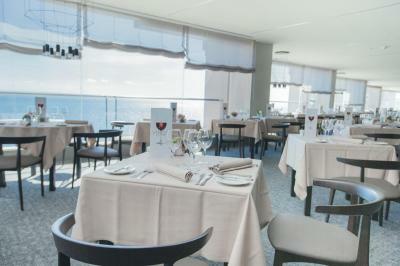 The Bonavista Restaurant offers impressive sea views and serves Spanish and international cuisine. Guests can watch as the hotel's expert chefs prepare their meals. Please note that men are required to wear trousers. Information about the restaurant's opening times is offered at the reception. Guests can also enjoy more informal dining at the poolside bar, or at the coffee shop. The Madison Music Bar hosts live music and shows. Illetas has regular bus connections to Palma, there is a taxi rank outside the hotel and the island’s airport is 12 mi away. Puerto Portals is a 10-minute drive from the Bonanza. 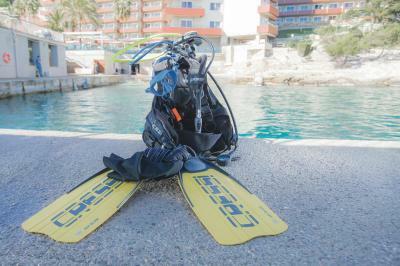 An on-site diving club is available for an extra charge. 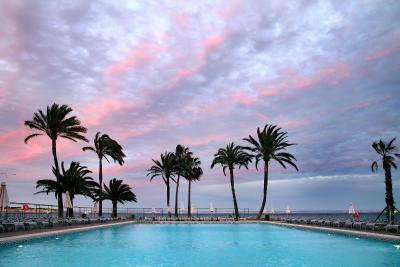 When would you like to stay at Riu Palace Bonanza Playa? 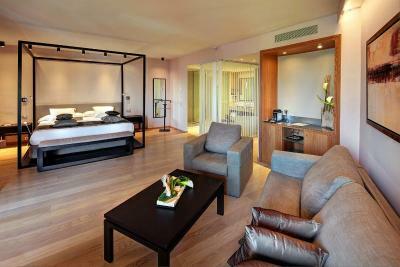 This spacious suite features a free minibar and a nespresso coffee machine. 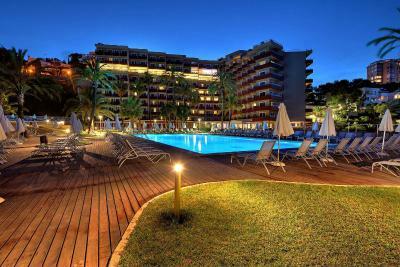 It has one bedroom, a large lounge and a terrace with lounge chairs and panoramic sea views. All rooms include free access to the spa. 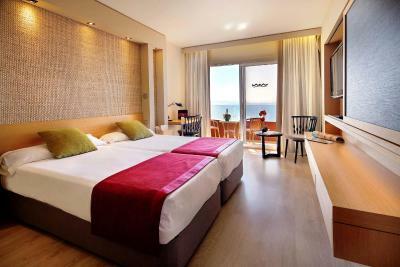 This air-conditioned room has modern décor, a flat-screen TV and a balcony with wonderful sea views. 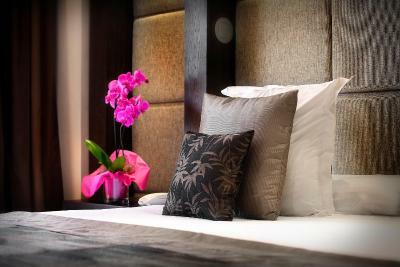 This air-conditioned room has modern décor, an extra bed, a flat-screen TV and a balcony with wonderful sea views. The Deluxe Junior Suite has a private balcony with sea views. A minibar is available in this room. 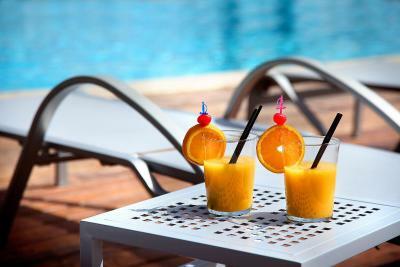 Sunshine, beach, relax, water sports, gold, spa… pool. 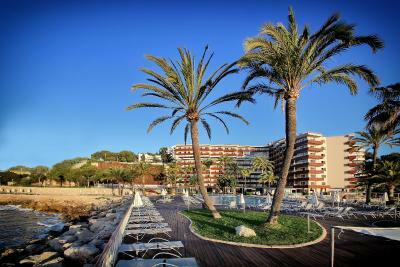 Our hotel was fully refurbished in 2013 with access to a beautiful private beach. The perfect spot for an unforgettable holiday. 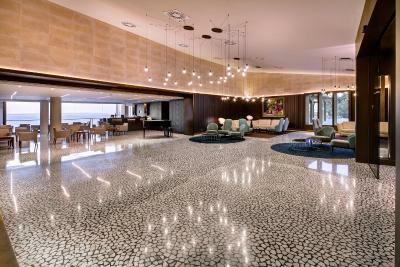 House Rules Riu Palace Bonanza Playa takes special requests – add in the next step! Riu Palace Bonanza Playa accepts these cards and reserves the right to temporarily hold an amount prior to arrival. Please note that men are required to wear trousers when enjoying dinner at this hotel's restaurant. Bathroom, it is not enough privacy in it. Feels like it is in same room almost without any isolation. Excellent food, breakfast and dinner as well, big choice of dishes, nice view from room balcony, friendly staff, very clean. Could be a good or a bad thing - but you’re a bus ride or 15 minute walk away from a high street of any kind. But there are a few little supermarkets within 5 minutes walk, so if you’re aiming for a quiet escape, then perfect. We caught the bus into Palma, really good service every 10 mins for €1.50 each way. Takes about 30 minutes. Very friendly and helpful staff, who all know that the little details matter. Smart, clean top-end feel. Good selection of food, with themed nights offering a few different options. Perfect servis. Nothing was problem. Change room - upgrade was for free. Everything was perfect. Manager at reception fullfill every wish with pleasure and smile. You have a real problem with the indoor pool which is supposed to be part of a spa. When we visited on a number of occasions there were quite a number of children treating it as an indoor swimming pool. Jumping in and out of the water, Shouting. splashing around in the jacuzzi and making a visit to the spa unpleasant. There were a number of Adults at the spa who were very unhappy with the situation. You should exclude Children under a certain age, or make it adults only. this is the only issue with the hotel. More outdoor children’s activities would have been great like a playground, table tennis, table football or billiards and perhaps longer children’s times in the indoor pool. Great location with comfortable rooms and excellent facilities, perfect for families with one of the few hotels to offer an indoor pool. Spa treatments for the adults too. 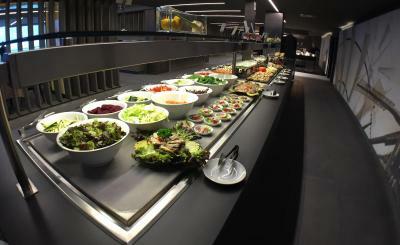 Food was excellent with a good variety of international options catering to all tastes. Evening by the pool bar with entertainment was a nice way to end the day. Staff in the buffet restaurant (especially Wilson, Gloria, Jackie, Jaumi to name but a few) and pool bar were really fantastic especially with the kids. Shared facilities with the sister property opposite meant we had use of the mini golf and tennis courts. Reception organised convenient and cheap car hire and excursions if needed. On days without the car the bus into Palma with all that this fascinating city has to offer was quick, cheap and frequent, plus it stops right outside the hotel. There’s also a lovely beach with beach club a short walk away. All in all superb! Location and views are fantastic. We had some minor issues with the room cleaning, they forgot to clean our bathroom one day for example. The noise from adjoining rooms was a bit more than you would want. The floors were floating wood floors that were not really nice and were a bit worn. Should be replaced by proper hardwood. The dinner was not spectacular so we mostly are outside the hotel. The hotel welcome was nice. The public areas are all very nice. The breakfast buffet was awesome. The staff were all very friendly and helpful. The rooms were comfortable but not luxurious. The views on the sea were amazing. Children should not be allowed in the spa. Lovely area, great views, clean fresh hotel. Spa was a bit over run with children on cool days. But all else excellent. Excellent location. Good breakfasts - plenty of choice. There is no privacy in the bathroom. 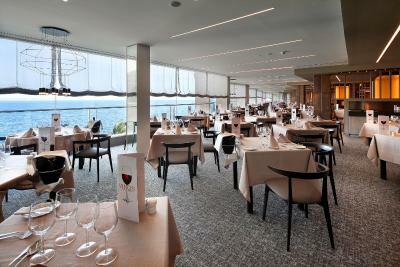 Friendly staff, amazing view to the sea, good food. We ejoyed sauna and warm pool with view. 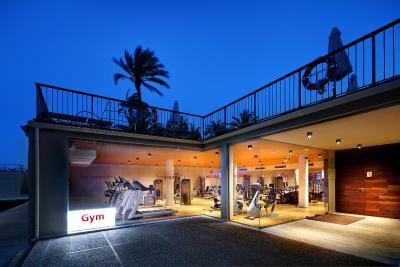 Also gym was with view to the sea. Everything was more than perfect! There is no issues! I highly recomend this place. Thanks a lot to the hotel staff! We will visit you again! Half Board.....All the food was superb , above our expectation. All members of staff were so friendly and the introductions from everyone including the Manager on our arrival was a very nice welcoming. This Hotel has a very comfortable and calming atmosphere and the outside sunbathing areas and the two outside pools are excellent. Total score 10/10 !